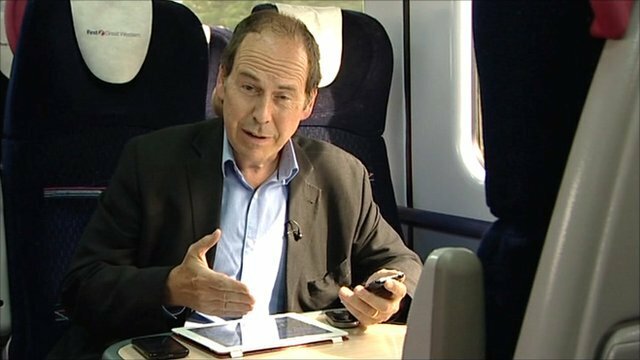 In July 2011, the BBC invited Android phone users to participate in an experiment to gather data on mobile broadband coverage. Around 44,600 people contributed to the crowd-sourced data gathering by granting an app permission to track the level of their data signal over three weeks. 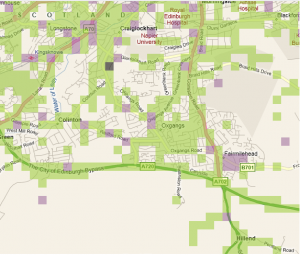 The results are published as an interactive map showing tiles approximately 200m x 200m in size coloured green for 3G, purple for 2G and dark grey for no coverage. You can filter the map by mobile operator. Given the self-selecting nature of the sample, you will find many areas with no colouring signifying no measurements were taken and in some areas some of the operators may not be represented. The Android app used was provided by Epitiro, the independent firm used by OfCom to provide data on mobile broadband provision in the UK. In Sep-Dec 2010 Epitiro conducted a much more systematic analysis of mobile internet provision in the UK and OfCom published the results in their report Measuring Mobile Broadband in the UK. The reports tells us what we already know: mobile broadband is extremely variable and not as fast as fixed broadband. The quantitative detail in the report may be of more value than the BBC’s crowd-sourced experiment.